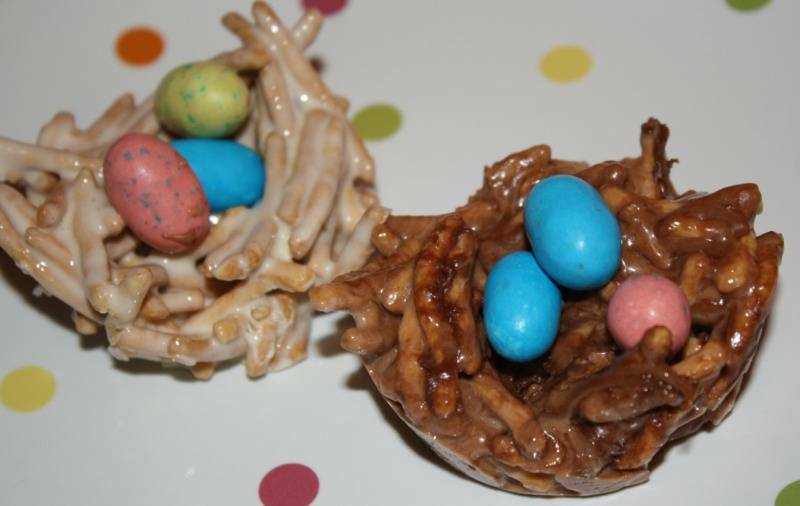 One of my favorite Easter desserts is this simple Birds Nest treat. They are very similar to rice krispie treats, which happens to be another one of my favorites. Not to mention they are so simple to make. In just a few minutes you can have them made and thrown in the refrigerator and ready to set. I made these last year but this year I added the special ingredient of Nutella. Oh yeah. Using a microwave safe bowl, melt the marshmallows and butter together in the microwave. Start at :30 seconds then mix together to melt. If needed, place in microwave for additional :10 second increments until melted completely. Add noodles and mix until marshmallow goo is all over noodles. At this point you can make some nests plain. Otherwise add the Nutella and mix until combined. Spray a muffin tin pan with Pam spray very generously. Using a spoon, scoop up some of the mixture and place in the tins. Use the spoon to make an indention in the middle to form a “nest”. Add candies. Place in refeigerator and let set overnight.